When it comes to preventive maintenance and car care, most Eagle Lake car owners know how critical it is to check their brakes. But brakes are more than just brake pads and shoes. There are a lot of components in the brake system, and they all need to be in good working order. But your braking system also has mechanical parts. These pistons and springs can also gradually wear out or get gummed up by oil, dirt and other road spatter. A brake inspection in Eagle Lake at Hughes Automotive Inc includes a check of these parts as well as the pads and shoes. Your honest Hughes Automotive Inc service advisor can then advise you of any parts that need cleaning or replacement. The fluid component to the brake system needs a regular check-up at Hughes Automotive Inc as well. The brake fluid cools and protects your brake system. Protective additives are gradually depleted by the operation of the brake system, and moisture build-up inside the fluid can diminish its effectiveness. When you have your brakes serviced at Hughes Automotive Inc in Eagle Lake, the fluid should be checked and, if needed, replaced, which will clean out water, debris and dirt. It is important to remember that your brake system also includes your tires. No matter how well your brake system is performing, if your sedan tires are worn, you won’t get good stopping power. Traction is the gripping power of your tires to the roadway. Traction is always better on tires with a good tread. Good traction translates to good braking. This is particularly essential on wet Eagle Lake roads. A good tire will give you good braking on either wet MN roads or dry. But stopping distance increases dramatically when worn tires meet wet roads. Tread on a tire acts to channel away water as the sedan passes over the wet road, thus maintaining contact between the tire’s surface and the road, which maintains traction. But the thinner the tread, the less effective the water channels become, and water can get between the tire and the roadway, reducing friction. A loss of friction means a longer stopping distance and possibly the loss of control. Braking depends on two things: the weight of your sedan and the speed of the vehicle. The heavier the vehicle or the faster the vehicle, the more braking power it requires. Thus, brake systems vary from vehicle to vehicle. For example, a pickup that is designed for heavy loads has a more powerful braking system than a compact car. Sports cars also have higher-grade braking systems than minivans. Regardless of what kind of car you drive in Eagle Lake, it is always good auto advice to keep your brake system in good repair, and that means ALL of your brake system. Just one more way to keep your travels accident and worry-free. For those of you in Eagle Lake MN who pay attention to these things, you may have been hearing about the new direct injection engines and want to learn more about them. Some deliver the power of a V8 with the economy of a V6. A professional fuel system cleaning from Hughes Automotive Inc gets out the gum and varnish in the whole system, including the fuel injectors. Keep those injectors clean and they’ll last a long, long time. Most Eagle Lake and Mankato drivers want to save on gas and seek our advice on improving gas mileage. At Hughes Automotive Inc, we are frequently asked, however, if it is really worth the extra effort. Just how much money can Eagle Lake car owners actually save? The US government has a website dedicated to helping us use less fuel. It presents the cost savings in a way Eagle Lake auto owners can relate to and is relevant for all vehicles. Let me give you an example: Having your sedan engine properly tuned, can save up to 4%. If you’re paying three-fifty for a gallon of gas in Eagle Lake, you could save fourteen cents a gallon. In today’s Hughes Automotive Inc article, we’re focusing on the things you can do to improve your sedan fuel economy driving around MN. We’ll tell you the potential savings per gallon of gas at three dollars and fifty cents, and we’ll show a chart that also shows the savings at three and four dollars. Fixing a faulty oxygen sensor can improve economy by up to forty percent. That’s a whopping dollar forty in savings per gallon. 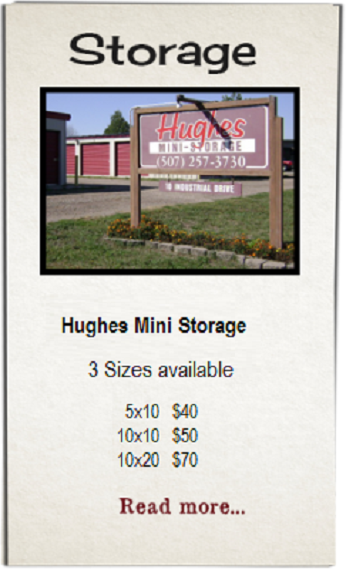 Bring your car to Hughes Automotive Inc in Eagle Lake and we’ll check your oxygen sensor. Chances are that if your oxygen sensor is kaput your check engine light will come on. Now, there’s any number of things that could cause your check engine light to come on besides oxygen sensor problems. But if it’s on, get it checked out as soon as you can at Hughes Automotive Inc.
Here’s an easy one for astute Eagle Lake car owners. Inflate your tires to the recommended pressure. That could save you three percent or eleven cents a gallon. Even a little drop in pressure will bring down your fuel efficiency, so check your tires every week. Your sedan car maker has recommended a specific weight of motor oil. The recommendation is based on engine design and will give you the best protection. Using a heavier weight could cost one to two percent in reduced fuel economy, or up to seven cents a gallon. Here’s one that’s free for Eagle Lake motorists that want to save cash: Take it easy when you drive. Aggressive driving (we’ve all seen this on Eagle Lake roads), rocketing away from stop lights, standing on the brakes, punching it for lane changes – really takes a toll on your fuel economy. Cutting out aggressive driving around Eagle Lake can save five percent or eighteen cents a gallon. Now on the freeway it gets really costly: thirty three percent or a buck sixteen a gallon. Think about that – and leave a little earlier. A related item is exceeding the speed limit. For example, if the speed limit is sixty miles per hour on your Eagle Lake interstate, an additional five miles will cost seven percent or twenty-five cents a gallon. Fifteen miles per hour will cost you upwards of eighty cents a gallon. At Hughes Automotive Inc we hear from a lot of people who are excited about the new diesel engines that will soon be available in passenger cars and SUV’s. But our MN friends are often curious about the preventive maintenance requirements. People may not know that diesel engines have long been used extensively in Europe and Asia. In fact, in some markets, there’re nearly as many diesel powered passenger cars as there are gasoline. Here’s who’s announced or is expected to announce new diesels for North America: BMW, Mercedes, Audi, Volkswagen, Nissan, Honda, Toyota, Hyundai and Subaru. Of course, the US auto makers will be expanding their diesel offerings as well. Diesels will become a very big deal here in MN. You may ask, why has it taken so long getting to MN and North America? There are a bunch of reasons like fuel tax policies and such, but the biggest hurtle was that MN diesel fuel had a high sulfur content – too high for the latest generation of highly refined diesel engines. Recent government mandates to remove sulfur now opens up MN to the engines the rest of the world’s been enjoying for a long time. Now diesel engines are heavy duty, so they cost more than gas engines. But they get better fuel economy – so the break-even point is largely dependent on the difference between MN gas and diesel prices at the pump and how many miles you drive. And diesels have a higher resale value. But going off what we already have in MN, we can expect fluid drain intervals to be similar to gasoline engines. Diesels do require very clean fuel, air and oil, so their filters are much higher capacity than gasoline filters and cost more. The engine air filter needs to be changed more frequently as well. High gas prices in Eagle Lake increase the cost of living for MN drivers. You’ve probably budgeted a certain amount for vehicle related expenses. Increased fuel costs now consume a larger portion of our incomes, causing some Eagle Lake vehicle owners to skimp in other areas – like scheduled maintenance. According to MN news reports and automotive industry studies, this is becoming increasingly more common. In fact, nine out of ten personal vehicles on the road have at least one maintenance or repair item that hasn’t been done. Some of these items pose serious safety risks. Others are just more likely to make it more expensive to drive. In this area, we can take a lesson from professional Eagle Lake vehicle owners. I’m talking about fleet owners and operators. You know, Eagle Lake folks like the trucking companies and delivery services. Because their livelihood depends on it, they have gotten scheduled maintenance down to a science. And the last thing they skimp on is regular maintenance. Why is that? Well, for one thing they know that routine maintenance prevents expensive repairs and costly breakdowns. They also know that a well-maintained vehicle uses less fuel. For them, even a small decrease in fuel efficiency may put their Mankato business in the red. Ring any bells? Can most Eagle Lake car owners honestly say that there isn’t at least one thing on the list that hasn’t been done? Let’s suppose you chose to spend one hundred and fifty dollars and get caught up on some of these services at Hughes Automotive Inc. Figure that they combine to improve your MPG by fifteen percent. What would that mean to your pocketbook? Well, the average personal vehicle in Eagle Lake is driven about twelve thousand miles a year. If you get twenty miles per gallon in your sedan, over the course of one year you would pay for the hundred and fifty dollars worth of service and save an additional hundred and sixty five dollars if gas is at three dollars and fifty cents. If gas is four fifty, you would save two hundred and fifty-five dollars. And you’d rack up savings of three hundred and forty five dollars with gas at five and a half bucks. From this you can see that the more fuel costs, the more it pays to keep up on scheduled maintenance. 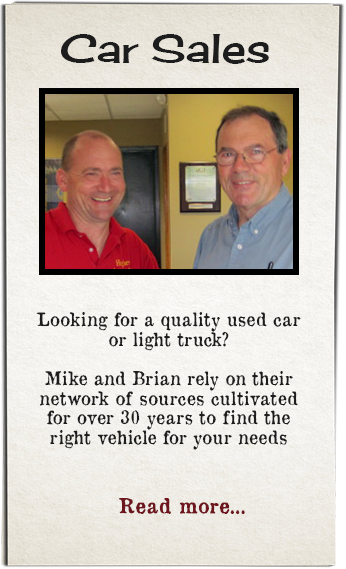 Some of us drive trucks in Eagle Lake for work or recreation – or want a large SUV for family needs. A fifteen percent improvement in gas mileage can generate huge savings – six hundred and sixty dollars a year if gas is four fifty a gallon in Eagle Lake. Take a look at this table to see where your savings could lie. 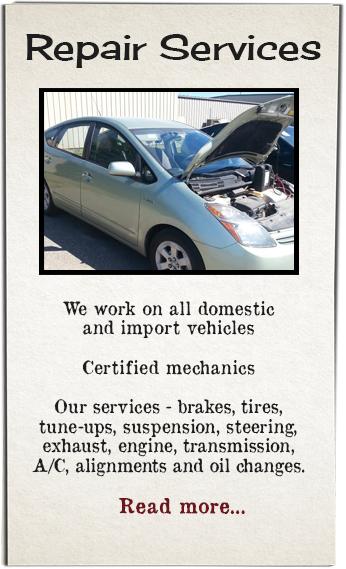 So catch up on those services you’ve been neglecting at Hughes Automotive Inc. Get a couple done now and a couple next time. Chances are you’ll save a lot of cash at Eagle Lake gas pumps this year – and a lot more on repairs in years to come. Is Your Eagle Lake Driving Severe? 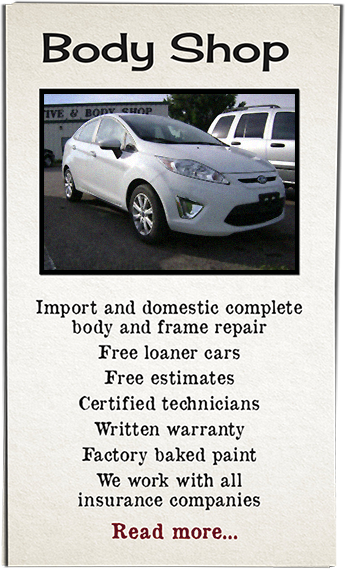 People near Eagle Lake MN often ask Hughes Automotive Inc how often they should have a particular service done. It’s a great thing to ask. You can look at your owner’s manual, or have your Eagle Lake MN service advisor at Hughes Automotive Inc look up your vehicle in a service database. What you find is often a surprise to people – there are actually two service schedules. One is the regular schedule and the other is the severe service schedule. Service intervals are shorter on the severe service schedule. When asked, most folks in Eagle Lake MN will say that their driving is normal and that the ‘regular’ schedule probably applies to them. ‘Severe service’ sounds pretty extreme – ‘I don’t drive like that’. I don’t know about you, but that doesn’t sound like my normal driving. It sounds more like ideal conditions. I live where it gets hot in the summer and cold in the winter. I run short errands around Eagle Lake. Occasionally we load up for family trips. Picture a line with ‘regular’ on one end and ‘severe’ on the other, and make a judgment on where you fall. If your regular oil change recommendation is 5,000 miles and the severe service recommendation is 3,000 – when should you change your oil? For me, it’s closer to 3,000 miles. For my wife, it’s closer to 5,000 miles. Your Eagle Lake MN auto service advisor at Hughes Automotive Inc will be happy to have this discussion with you and help you sort it out. So you love your job, and your family life is great. Congratulations! You have achieved balance. But can you say the same for your wheels? Eagle Lake car owners can tell if their tires are out of balance by vibrations at higher speeds on MN interstates. If one of the front tires is out, you feel the vibration in the steering wheel. If it’s a back tire, you’ll feel the vibration in your seat. Tires and wheels are pretty heavy. When a tire is mounted on a wheel at Hughes Automotive Inc, it is usually not perfectly balanced. So the service specialist will spin the tire on a machine to determine where it’s too heavy. He will then place weights on the wheels in strategic locations to balance it out. When a tire is out of balance, it actually bounces down the road instead of rolling smoothly. Since the average size tire rotates at about 850 revolutions per minute at 60 MPH, it is actually slamming into the pavement 14 times a second. That’s where you get your vibration. Most Eagle Lake drivers are surprised at how smoothly their car rides after balancing all four wheels. Most high-quality tires sold in Eagle Lake hold their balance pretty well for car owners. They just get out of balance gradually with normal wear and tear. If you suddenly feel a vibration, it is probably because you lost a wheel balancing weight along the way. Definitely get a balance at Hughes Automotive Inc in Eagle Lake if you feel a vibration, change your rims or have a flat repaired. Putting off a needed balance job leads to excessive and dangerous tire wear, wear to your shocks, struts, steering and suspension parts. Wheel balancing not only improves your ride and handling, but also can save you some expensive repair bills and possibly an accident. Additionally, you will get better fuel economy. Some Mankato car owners have their tires balanced at every rotation. Others do it every other time. Check your owners’ manual for your requirements, or ask your honest Hughes Automotive Inc service specialist. Doing this will put you on the path to mechanical wheel balance. Screeching tires, crunching metal – it’s an accident! If you’ve ever been in a car accident in Eagle Lake, even a minor one, you know how upsetting it can be. It’s hard to think straight and know what to do. When an accident occurs, you should always stop. Leaving the scene of an accident in Eagle Lake is considered a crime – even if it’s not your fault. And hit and run penalties are fairly severe, possibly resulting in steep fines, loss of your MN driver’s license or even jail time. Your jurisdiction may require that you try to help someone who is injured by calling for help or performing first aid if you are able. Warn other Mankato and Janesville motorists by putting out flares, using your flashers or lifting your hood. Call Mankato emergency services as soon as possible. Tell the operator if medical or fire help is needed. Eagle Lake drivers should always file a police report. It’s tempting for Eagle Lake motorists to skip this if everything seems to be ok. But without a police report, the other guy can say whatever he wants about the accident later, and you’ll not have an objective report to help defend yourself. Discuss the accident only with the police. Emotions are strong after an accident and we naturally want to talk about it – don’t. Never admit fault or guilt to anyone including the Eagle Lake police officer. Sometimes we may feel at fault, but in the eyes of the law, the other guy is responsible. Also take down a description of the other Eagle Lake vehicle, license plate and vehicle identification number. Most MN auto insurance companies don’t record license plate numbers, so the VIN number is the best way to track a vehicle in MN. Contact Hughes Automotive Inc to learn more about what do do in case of an auto accident. Hughes Automotive Inc and AutoNetTV hope that you never have to use this information and wish you happy Eagle Lake travels. One might say the most challenging part of being an automotive service technician at Hughes Automotive Inc in Eagle Lake MN is diagnosing a problem before it can be fixed. Let us introduce you to something we’ll call Customer Detective Work – that is helping your Eagle Lake MN technician find clues to what’s wrong. We start with the detective basics: What, Where and When. Play along with me. You come in to Hughes Automotive Inc and your car is making a funny sound. Do you see where we’re going? You’re gathering additional information to help your Eagle Lake MN technician know where to start. Based on your car and the tech’s experience, he’ll know where to look and can start with the obvious suspects. Your Eagle Lake MN technician at Hughes Automotive Inc will need to be able to duplicate the problem if possible so he needs to know details, like ‘it stalls after it’s been driven for about 20 minutes and I go over 50 miles an hour’. If the fuel system in your sedan is dirty, you will be hurting your gas mileage and losing performance as you drive around Eagle Lake, MN. Unless they drive a vintage car, Eagle Lake car owners have fuel injectors which need to be properly maintained. That is why your sedan owner’s manual has a schedule for cleaning your fuel injectors and other parts of your fuel system. 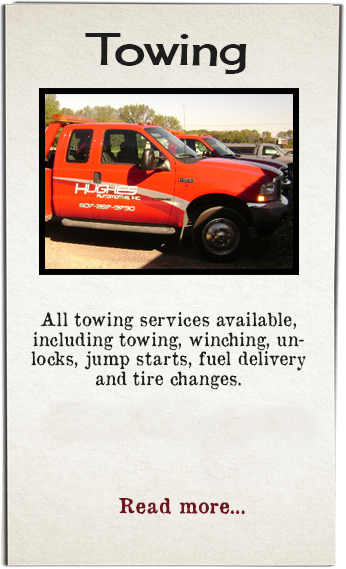 Your honest service advisor at Hughes Automotive Inc in Eagle Lake has the tools and chemicals to do the job right. Hughes Automotive Inc uses a process that gives your car a deep, professional fuel system cleaning. The particles, gum and varnish that build up in your fuel system are removed so that it can run cleanly and efficiently. After a professional fuel system cleaning at Hughes Automotive Inc, you’ll notice more power, improved MPG and reduced exhaust emissions. AutoNetTV strongly recommends you follow your auto manufacturers fuel system cleaning service recommendations to keep your sedan running strong. Eagle Lake auto owners don’t need the added expense of replacing a fuel injector that’s been damaged by neglect. Check with your honest Hughes Automotive Inc tech and see when your car is scheduled for an important fuel system cleaning.